Remember playing outside in the backyard on a warm summer day with your real live friends and running inside for a big glass of Hi-C Ecto Cooler! The tasty green juice from a little tin barrel that needed two holes punched in the top. I remember riding my bike to school in the morning, home for lunch and back, then home again after school. Playing dodgeball, climbing ropes, and watching the space shuttle Challenger explode were all a part of my youth. 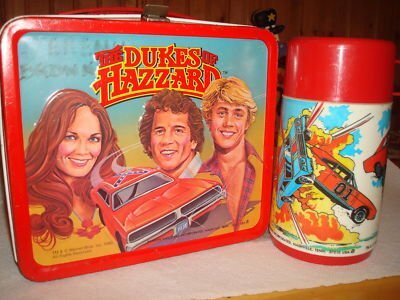 Mr. T was cool, Prince was his name, Garbage Pail kids were trading cards, and the Dukes of Hazzard were on my tin lunch box. Things were totally awesome then! What has happened to us? Kids classrooms are no longer allowed to celebrate calendar events like Christmas or Valentines because ONE person in the class might be offended. Dodgeball and rope climbing have been deemed way too dangerous. There’s no Presidential Physical Fitness test because someone might feel inadequate if they don’t get a patch! As a parent I’m too scared to let my son ride his bike to school because some creep might take him, and Heaven forbid he doesn’t wear his seatbelt… despite the fact I rode in the back of my dad’s pick-up or in the back window of my mom’s car. Today’s technology has improved some things, but others have just become watered down. I think when I take Dylan to school tomorrow we’ll get in the car through the windows, listen to the Miami Vice soundtrack, and wear our Swatch watches. Then I’ll tell him to celebrate Easter in his classroom by talking about Jesus, the one who died for our sins, the real reason for the spring holiday. If that offends someone, too bad we won’t be able to hear their complaint over the sound of our boom box blasting “Born in the USA” on our shoulder. Maybe they can go take selfies on their bosu ball and post it on Instagram while the rest of us get back to deadlifting, doing push-ups and making real progress! Stop over thinking everything and don’t adjust what you do to accommodate the 10%’ers… Fire it up! Posted in fitness stuff.Tagged 40's, attitude, Corey Howard, coreyhoward, Deadlifting, father, fitness, husband, Parenting, Physical Fitness, strength training, wife. Previous Post Surgery & Set Backs… Fire It Up!